The alternative Irish band Emmaus will be at First Reformed Church in Xenia, OH May 15 7:30pm. This Irish band is comprised of both Catholics and Protestants. Probably makes for some interesting discussions! The New album "All Over the World" sees Emmaus hitting the grunge-pop gospel heights. Emmaus are now touring America with this album and are in the process of recording and producing a new US album. 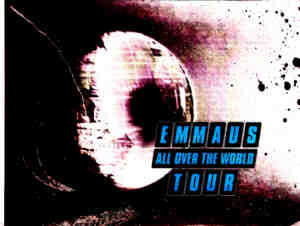 Emmaus, the politically controversial alternative music group straight from the rocky shores of Ireland, is currently kicking off their six month (April - September '97) "All Over The World" tour. They have just completed a self-titled album on Los Angeles-based Infiniti Records and a cutting edge Euro-retro style music video of the single "All over The World." They mean to change both the music and religious political world in one big worldwide swing. The three month U.S. tour began in April with over 40 coast to coast dates from New York to California. It will be followed by an even more intense three month tour of most of Europe, including England, France, Germany and The Netherlands. Several networks in the U.S. (NBC Dateline, the 700 Club, TBN, the Catholic channel) are planning interviews based solely on the group's conflicting political/religious backgrounds. The eight member band is rare in itself, as it is composed of both Protestant and Catholic members from Dublin and Belfast. 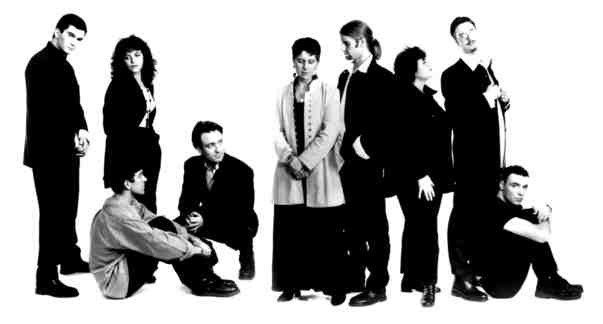 Their sound is as unique as their religious backgrounds, musically speckled with a tint of Alanis Morrisette (via lead singer Joanne Johnston), with a touch of Seal-like Euro-pop grooves, overlaid with thick R & B drumbeats/baselines, and saturated with Enya-like angelic background vocals. You do not want to miss this concert.